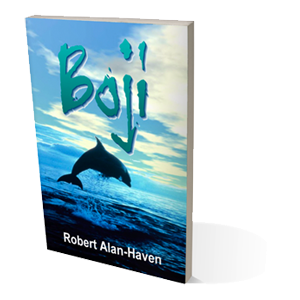 Boji is the story of a bottlenose dolphin with a passion for pursuing his individual destiny, wherever it may lead him. Many of his adventures come from his drive to push against the limits of the known, to expand his boundaries, to incorporate more and more of the unknown within his experience of being a dolphin in the oceans of the world. While completing his working life as a management consultant specialising in presentation skills, Robert Alan-Haven‘s passion for self-exploration led him to the world of the dolphins and their apparent kinship with humankind. He has observed and swum with dolphins, in captivity and in the wild, all over the world and delights in writing and speaking about his adventures.